We are celebrating 56 continuous years of Gemütlichkeit! The Deutschmeister Brass Band provides musical entertainment and German atmosphere for a wide variety of audiences. Since its founding in 1963, the band has performed at various functions around St. Louis and across the U.S. 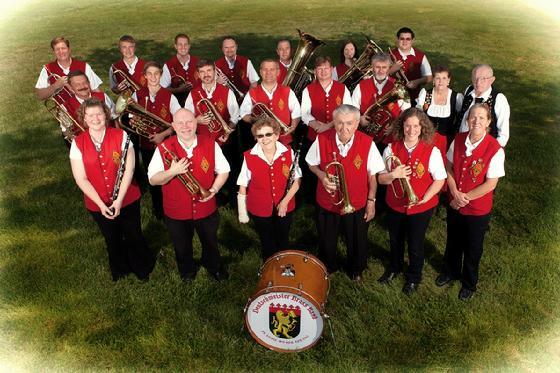 The band is a part of the German Cultural Society of St. Louis, and is dedicated to preserving the musical tradition of the German and Middle European cultures, while bringing a modern flavor to the traditional German brass band style. With this blending of styles, the band attracts a broader, non-German audience, furthering our goal of spreading German culture through music. The band is structured after the European military bands of the late 1800s and performs a wide variety of music. Our library contains marches, polkas, waltzes and tangos with over 300 compositions ranging in styles from classical to military and American to German brass band. Our German band is well-known throughout the St. Louis metro area, having performed at many local festivals including the Maifest in Columbia, Illinois, Bevo Day in South St. Louis, Soulard Oktoberfest, St. Charles Oktoberfest, and the Strassenfest in Downtown St. Louis. The band also performs at various events for the German Cultural Society of St. Louis including the Kirchweihfest, Maifest, Oktoberfest, dances, Christmas and Easter concerts. Our travels have taken us to Detroit, Cleveland, Cincinnati, Milwaukee, Chicago, Germantown, Teutopolis, Hermann, Kansas City, and Leavenworth for performances at festivals and dances.